In today's market your 1961 Franklin half dollar value is tied closely to its silver price, currently they are worth $5.60 each. As a collectible a premium has developed for those in better than average condition. It is the condition of your coin that determines how much it's worth. 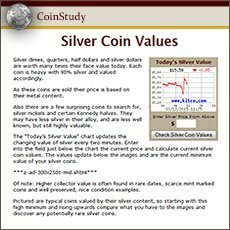 Looking at the chart; the "uncirculated" grade is now at a premium over base silver value. Also, notice there is no difference in value in the circulated grades. If your coin is worn it is considered as bullion silver, if uncirculated, only then is it valued as a collectible. Large quantities of 1961 half dollars were produced, and it is safe to say many are available today. The future of those that are worn is to always be looked upon as bullion related. It is within the uncirculated grade that future value has a chance to rise faster than its underlining silver worth. In order to safely place a value on your coin it is necessary to become comfortable in your ability to judge the difference necessary to decide if the coin is either worn or not. Study carefully the grading section found below the value chart, especially the "about uncirculated" and "uncirculated" grades. 1961 Franklin half dollar value is sure to rise long term, with an emphasis on the top quality coins. An interesting fact about a 1961 Franklin half is the Denver mint production was two and a half times larger than the Philadelphia mint. 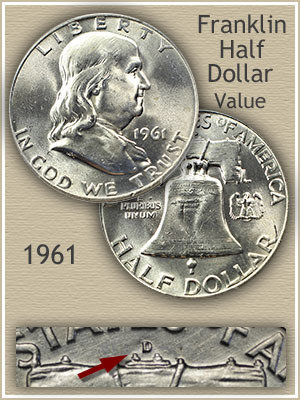 Also consider, collectors in their quest for a complete set of Franklin halves include both mints of 1961. So here is the theory, over time, because of the original quantity difference, the Philadelphia coin (may) develop a premium. Identify the mint of origin of your coin determining if a mintmark is present. Denver use a small "D" to identify their coins, Philadelphia did not use a mintmark. Look on the reverse just above the bell. 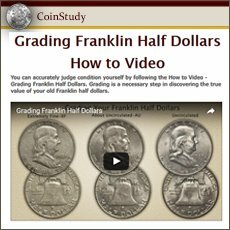 An overall feature of Franklin halves is the visual difference between a well struck, highly detailed coin and a weakly struck example. As collectors advanced their study of the Franklin series it became apparent many of the coins were softly struck rendering subtle details either fuzzy or missing. Finer details of Franklin's hair, lettering in the center of the Liberty bell and lines along the lower rim of the bell are often lacking. These details, when present, give the coin a noticeable refined look. Following the collector theme of adding the finest to their collections, the hunt for "full struck" Franklins began. It was quickly realized certain dates including 1961 were scarce in a full struck state. Now, market forces followed by awarding premiums to any well struck Franklin. And finally to aid in recognition, completeness of the lower bell lines is used to designate the coins. An uncirculated "full bell line" Franklin is now in a higher value category. This 1961 Franklin half dollar value is benefiting from its status of having full bell lines. Auctioned by David Lawrence rare coin auctions, bid to $138 and because of its scarcity represents a full $100 in value over any 1961 half without a bold strike. Grading the condition of coins develops the standard by which an accurate value is found. All value is based on condition as a major factor. Date and mintmark are first determined and then what is considered just as important is the preservation of the coin. In the case of your 1961 half dollar pay close attention to the difference necessary to qualify as uncirculated. Uncirculated: An all original surface, without wear, is the definition of the "uncirculated" grade. Here is a coin with a wide appeal to collectors. Inspect the mint luster looking for any breaks, these indicate the half dollar saw use and developed wear to the surface. This mint luster is the fine texture imparted to a coin at the time if striking. Fine grains of metal radiate out from the center giving the coin its distinctive "new" look. If any wear is present it transforms to a dull silver grey. First to show the effects of wear are the high points, notably Franklin's cheek and eyebrow. 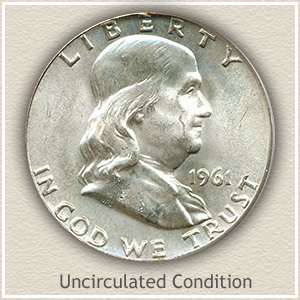 About Uncirculated: Compare the image of this "about uncirculated" condition half dollar closely with its uncirculated counterpart above. Bullion value and higher collector value separates the two. A big difference in 1961 Franklin half dollar value hangs on the judgment call. Many coins at first glance have the appearance of uncirculated. However, even a slight amount of wear disqualifies a coin from the sought-after uncirculated grade. Tilt your coin to the side so the light hits it ay an angle. Focus in on Franklin's cheek; allowing the light to play off the surface, if any of the delicate mint luster is removed a dulling of the surface accrues, confirming wear. Additionally, on the reverse, the lettering within the center of the Liberty bell is also one of the high points of the design and the first to wear and become dull. 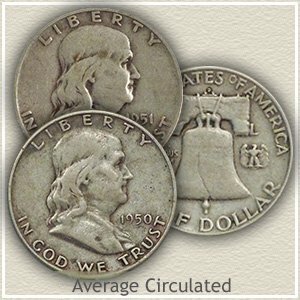 Average Circulated: Average circulated is not as much a grade as a category, referring to a range of wear on your coin from light to heavy. All 1961 half dollars that show wear are valued as bullion silver pieces; the amount of wear does not matter. All mint luster is gone and one of the easiest places to confirm the presence of wear is the lettering on the Liberty bell. Low relief to start, it quickly becomes blurry with wear. Return to Coin Values Discovery... find 1961 Franklin half dollar value and... Coin Values of all US series. 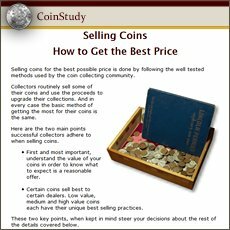 Use the image index to identify your coin. Pennies through gold coins all have value charts, mintmark locations described, and importantly grading images to determine condition and find an accurate value of your box of old coins. Silver value is dynamic, rising and falling over time. Franklin half dollar value trends with this change. However there are exceptions that rise above base silver price, notably certain dates, mintmarks and ones in collectible condition. Silver US half dollars were first minted in 1794 and continued to 1964. Your 1961 Franklin half is part of this long history. All series of half dollars are imaged to help identify your coins, with links to specific value charts.